I am not a professional photographer, so when I got this item, I sent it to Larry Guyer of Archetype Imaging, LLC, the sole authorized service facility for BetterLight products. Larry checked this unit out, installed a new hard drive to insure years of trouble free use, and has declared it fully operational and performing to its designed specs. DCS PRO BACK 645H. DCS Pro Back 645H. LA SIGLA (PRL): PARMALUCA. SISTEMA HASSELBLAD H. KODAK PROFESSIONAL. said Stephen Noble, Worldwide Product Manager, Kodak Professional. to create the best possible images. Phase One P30 Digital Back. Their products are known for their quality, flexibility and speed enabling pro photographers to shoot in a wide range of formats. Sensor Cap. The sensor is clear and free of scratches. we will get back to you as soon as possible. Focusing and Depth of Field Scales. Rigid Aluminum Alloy Body Construction. For Mamiya 645 AFD, AFDII, AFDIII & PhaseOne 645 DF . (The Back is compatible with Mamiya 645 AFD, AFD II, AFD III, PhaseOne 645 DF, DF ). Leaf Aptus 22 Digital Back. This Digital Back has 6,982 actuations. Modular design has always been a part of the Phase One philosophy. Sensor Cap. The sensor is clear and free of scratches. we will get back to you as soon as possible. Both versions feature: dual range focusing. Film Version: standard bellows, split monorail, adjustable tripod mounting block, ground glass back. Converts easily and economically to 120 film formats. Sinar p3 conversion (P2) digital pro View camera. Sinaron Digital CMV lens. Serial #58462. Made in Switzerland. Include original Sinar NORMAL interchangeable bellows with 12" normal base rail. Sinar tripod clamp. Gear precise focusing. Weight is 11.9 lb., with 12"base rail. Mamiya 645 Leaf Aptus-II 8 40MP Medium Format Digital Back. Complete kit w/case. Phase One / Mamiya 645 AFdII Leaf Aptus-II 8 40mp Digital Back. Serial # LI302505.49,201 exposure count on this back. Back is compatible with the Mamiya 645AFD. This digital back provides 40Mp of resolution from a 44 x 33mm CCD image sensor with 7312 x 5474 pixels. 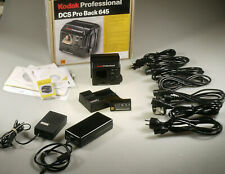 Hasselblad, V-system compatible (except SWC series). Effective pixel: Up to 8 million pixels Equivalent (iPhone SE). Corresponding iPhone also includes SE. Does not include iPhone! V system as well as the 1000 series 1000 F, 1600 F can be installed without problems. It contains adapter for Hasselblad H-system digitalback. (digitalback not included!). Or I also have Mamiya M645 adapter If you want I can change adapter. Phase One P65 65MP Digital Back HASSELBLAD MOUNT (H mount) 28,309k count (see image). Condition is Used but amazing. Slight wear on the rubber for the bottom of the back (see picture) - but other than that perfect. Note that I left the screen protector on the back so it's in beautiful perfect condition. Works great, has been well cared for. Comes with three batteries - charging doc cord, a "digi clean" kit - some accessories (see picture) a lens calibration kit (white plastic card in box) some pamphlets and color checkers that came with the back. The IQ250 gives you high quality images, whether you are shooting at ISO 100, 6400 or anywhere in between. Sensor Cap. The sensor is clear and free of scratches. we will get back to you as soon as possible. Sensor clean with no marks. Has to be used Tethered via Firewire. selling my lovely Phase one 65 , works perfectly but shots on the card only.., the fire-wire connector is broken. The first digital back from Phase One. This is identical to the later H5: 6MP, 16-bit, 36 x 24 sensor size with ISO 50-100. The digital back is in good working condition. /- 3/10 mm in Stufen von min. Nur für Digitalbacks. Used Phase One IQ1 60MP Digital Back. Mamiya Fitting. We cannot accept any liability/responsibility in the choice of goods you have ordered. Teamwork Photo and Digital, London's professional Digital/Photo supplier. You are looking at a great copy of the Leaf Aptus-II 12 80 MP Mamiya mount digital back. Sensor is in pristine condition with zero flaws. We cannot accept any liability/responsibility in the choice of goods you have ordered. Amongst the many products lines we carry are Lee Filters, Formatt Hitech and Heliopan filters, easily one of the most extensive and varied range of filters and accessories in the U.K. It is the ideal tool for the photographer looking to achieve fantastic photographs in a well made casing. It is the perfect tool for the professional looking for more detail to push their passion to the next level. 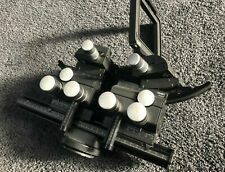 Cambo SLW-89 digital back mounting plate for Hasselblad H backs. For Digital backs that fit 500cm 501cm 503cw etc. Electronics - 10. HAS LIGHT SCRATCHES & WEAR . IN GOOD CONDITION . SEE ALL PHOTOS . IQ3 100MP for XF (Mamiya/Phase One). ISO50 - 12800Mount OptionsPhase One XF (DF/DF )Tethered CaptureFirewire 800 & USB 3Live ViewIQ3 Touch Screen via USB to Capture One to HDMI output. This is a used Phase back in excellent condition as seen in the photos, still has back screen cover attached. Cambo SLW 88 Back plate for Phase One / Mamiya digital backs. Mint condition with little use. Compatible with the latest Phaseone digital backs with Cambo cameras. PHASE ONE 1Q140 - LOW SHUTTER COUNT - 17900. PHASE ONE HARD CASE. SENSOR CLEANING KIT (70% LEFT).